NEW YORK (AP) — A big Yahoo investor is asking for a leadership change at the beleaguered company and pushing for the spinoff of its core Internet business. "Despite over three years of effort and billions spent on acquisitions, the management team that was hired to turn around the Core Business has failed to produce acceptable results, in turn, causing massive declines in profitability and cash flow," Starboard Value LP wrote in a letter released Wednesday. "It appears that investors have lost all confidence in management and the Board." If changes are not forthcoming in leadership, Starboard said, an election may be needed to replace some members of the board. Starboard did not include any specific names in its letter. 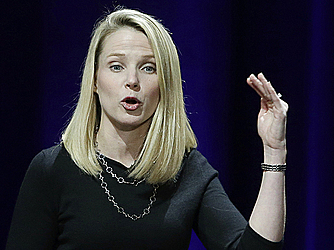 Mayer became CEO of Yahoo Inc. in 2012 and Webb became chairman in 2013. Starboard did not respond to a request from The Associated Press for comment. In a statement, Yahoo reiterated Mayer's previously stated intentions to unveil details of a reorganization later this month when the Sunnyvale, California, company announces its fourth-quarter results. Mayer has promised to close Yahoo's least profitable services in a purge that analysts believe could result in hundreds of employee layoffs. "Our board and management team engage in and maintain regular, open dialogue with all our shareholders, and consistently strive to deliver and to maximize shareholder value," Yahoo said. With shares down 35 percent over the past year, Yahoo is facing mounting pressure from unhappy shareholders. Last month, New York hedge fund SpringOwl Asset Management and Los Angeles investment firm Canyon Capital Advisors outlined steps they believe Yahoo should take. SpringOwl wants Yahoo to lay off 9,000 of its 10,700 workers and eliminate free food for employees to help save $2 billion annually. Canyon Capital recommended Yahoo sell its Internet business. Starboard had also threatened an attempt to overthrow Yahoo's board if the company continued with plans to break off its $31 billion stake in China's Alibaba Group. Yahoo eventually scrapped that plan and instead announced the spinoff of its Internet operations. Starboard said Wednesday that it thinks Yahoo can improve the performance of the core business and separate its assets. "We are confident that both of these objectives are achievable, but will require a change in leadership and strategy," Starboard said in its letter. Yahoo has been working on a cost-cutting reorganization plan, with details expected to be announced this month. Its stock dipped four cents to close at $32.16.